Once upon a time, staying healthy and fit was simple and uncomplicated. But, the modern nutrition and health industry has churned out enough jargons and techno-babble to confound and scare away most of us. The surging popularity of cold-pressed juices and ‘juicing programs’ has given new meaning to age-old terms like detox. Every day I’d come across articles on ‘juicing’, ‘detoxing’, ‘cleansing’ on social media. I ignored them for a while, assuming that the ‘fad’ would die down. But, I was quite wrong. Cold-pressed juices are on the verge of going mainstream and the popularity of ‘detox’ programmes is also on the rise. 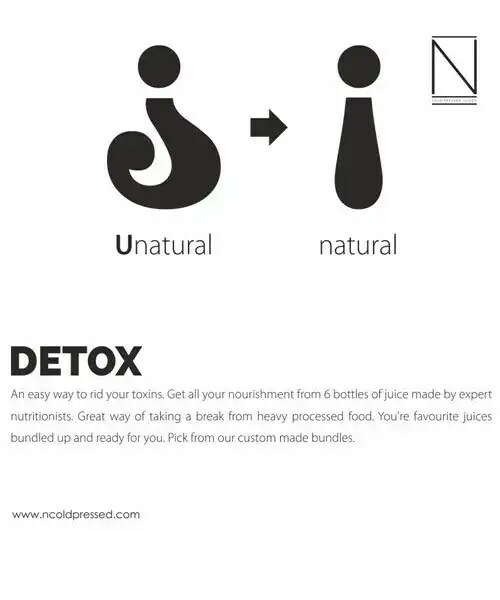 So when N Coldpressed invited me to experience their detox program, I happily agreed. N Coldpressed is a juicing program that requires the consumer to completely switch to a liquid diet. You can opt for a 1/2/3 day program, and for the duration of the ‘cleanse’, you’re only allowed to consume the supplied juices and water. Nothing else! Each day, a pack of fresh, cold-pressed juices will be sent to you early in the morning. I opted for a two-day detox programme. I received my delivery at 8:45 AM on the first day, and at 8:25 AM on the second. There are six juices in the pack – each has a specific time mentioned on it along with a list of ingredients. The juices were reasonably cold when I received them. I drank the first juice immediately and stored the remaining in the fridge. After half an hour, I put the bottles meant for afternoon and evening in my bag and headed to work, where I refrigerated them once again. The juicing regimen starts at 9:00 AM and ends at 9:30 PM. However, since I usually sleep around midnight, I eeked out a bit of extra time by adding extra ten minutes between each round. I ended up consuming my final juice around 10:30 PM. One of my main concerns was about feeling hungry. Hunger is debilitating for me as it makes it impossible for me to concentrate on my work. Thankfully, the periodic 400ml refuel of juices was enough to satiate my appetite. Your mileage may vary; I’ve a small appetite and in spite of being a foodie, I’ve never managed to finish off a plate of Hyderabadi Biryani. Below are my notes on the juice pack for Day 1. 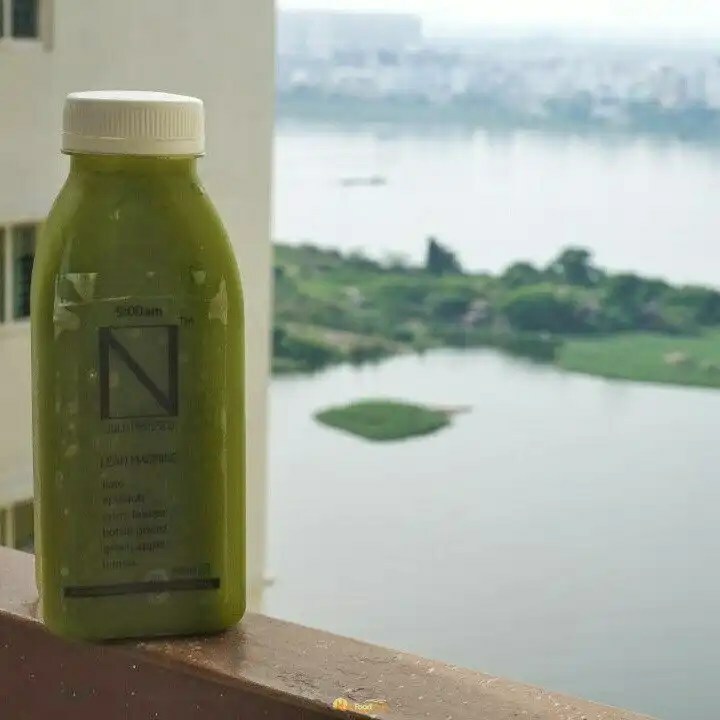 9:00 AM – Lean Machine Kale, Spinach, Curry Leaves, Bottle Gourd, Green Apple, Lemon I was hoping for a sweet beginning of the day, but N Coldpressed had other ideas. The bitterness from kale and bottle gourd makes it unpleasant, but the Apple and Lemon make it tolerable. 11:30 AM – Fuel Up Pineapple, Celery, Pear, Raw Honey, Flax Seeds This was quite easily my favourite juice of the day. The characteristically sweet and tart pineapple flavour blends really well with the sweetness of the honey and pear. 2:00 PM – Quick Fix Sweet Lime, Beet Root, Goose Berry, Ginger, Chia Seeds How much you like this will depend on how you feel about beetroot. I don’t mind beetroot in a bong style Veg Chop, but it’s definitely not one of my favourite veggies. The ginger lent it a bit of spiciness, but the dominant ingredients were beetroot and gooseberry, which made it rather offensive on the whole. 4:30 PM – Trash Out Papaya, Carrot, Ginger, Green Apple, Cinnamon I wouldn’t call this exactly delicious, but it rather easy to drink and somewhat enjoyable. All of the ingredients were stuff that I like. 7:00 PM – Go Blush Plums, Cucumber, Aloe, Lemon, Basil Leaves, Red Apples, Honey I was glad to finished the quota of veggie mixes for the day. The dominant flavour in this was that of cucumber, with the apple providing the finishing notes and successfully drowning out the discordant notes of aloe. 9:30 PM – Catnap Coconut Water, Inknut, Almonds, Green Apples, Black Berries This was a great way to finish off the day. Not overtly sweet, but refreshing and relaxing. When I requested N Coldpressed for a two-day juice pack I was strongly advised to only do a 1-day detox. It’s the recommended duration for a first-time juicer. Also, multiday detoxes are recommended only if the consumer’s current schedules are favourable for a ‘stress relieving’ regime. I opted for a two day as I expected the first day to be smooth sailing and any challenges to show up only when detoxing for a longer duration. And pop up they did. I began the day feeling normal and without any symptoms of fatigue. However, minutes after consuming my first juice from the ‘Eclectic’ pack, I began to feel queasy. An hour later, I began throwing up. 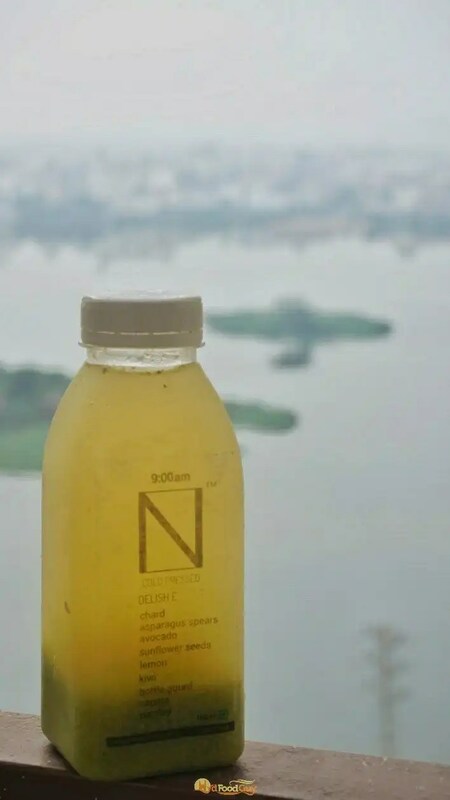 N Coldpressed recommends consuming large amounts of water during the detox regiment, and I estimate to have drunk close to three litres during Day 1. I suspect that this might have flushed out a lot of the salts and caused an electrolyte imbalance. After throwing up the second time, I decided to take a break the regimen and consumed a glass of lemon juice with excess salt. This seemingly did the trick – my nausea disappeared and I was feeling much better within an hour. I resumed the detox schedule and went back to juicing. 9:00 AM – Delish E Chard, Asparagus Spears, Avocado, Sunflower Seeds, Lemon, Kiwi, Bottle Gourd, Sapota, Parsley The name was promising, and this indeed turned out to be a much better beginning than Day 1. I wouldn’t call it delicious, but at least there were hints of sweetness before the other flavours reared its head. 11:30 AM – Jump High Pomegranate, Sweet Lime, Pineapple, Basil Leaves Once again, the second juice of the day turned out to be among the best tasting ones. It’s an eclectic combination but thankfully a pleasant one. 2:00 PM – Burn It Bottle Gourd, Pumpkin, Sweet Lime, Raisins, Wheat Grass, Thyme The ingredients list was scary – Bottle Gourd, Pumpkin and Wheat Grass. Unfortunately, the real thing tastes way worse than anything I could have imagined. It made me almost barf. I made two attempts and could consume only about ten percent of the bottle before giving up. This is the stuff of nightmares! 4:30 PM – H2O Potion Water Melon, Coconut Water Crunch, Pomegranate, Lettuce One of the consistent themes with N Coldpressed juices is that there’s always that one ingredient that the juice would have tasted better without. This one was a cake walk compared to the previous one but the lettuce did spoil the flavour a bit. 7:00 PM – C-Blast Pineapple, Basil Seeds, Pear, Sweet Lime, Red Apple This is one of the fruitier mixes and I had no trouble in finishing this one off. 9:30 PM – Stress Cure Red Apples, Indian Ginseng, Fennel Leaves, Plums, Sweet Lime, Sapota The final juice of the day lived up to the name of the pack. An eclectic combination that didn’t quite gel together. There are two different techniques to extract juice from fruits and vegetables. The traditional technique uses centrifugal juicers that spin the food at a high speed to convert it to a pulp from which the juice is extracted. The newer masticating juicers are somewhat similar to chewing food but at a much slower pace. High pressure is applied and the food is crushed and squeezed at a slow speed to extract the juices. Juices extracted using masticating juicers are referred to as Cold Pressed Juices. Masticating juicers are expensive, however, they are more versatile. Proponents of cold-pressed juices argue that cold-pressed juices are healthier as the heat generated by centrifugal juicers result in loss of nutrients. There are studies out there that show that this is true. I reached out to N Cold Pressed to see if they had done any studies of their own. They sent me results of studies conducted by Certified Laboratories, Inc. that was commissioned by juicing firm Good Nature. In all the comparisons, the Cold Pressed juices retained more nutrients. However, nutrition research is often incredibly complex and the jury is still out on the final health impact of cold-pressed juices. While The Wired wrote that ‘Nobody Can Prove That Cold-Pressed Juice Is Better for You’, the Vox went a step further and declared that ‘Cold-pressed juices are a waste of money’. Does Detoxing or Cleansing Work? Even more contentious than the health benefits of Cold Pressing is the debate over the utility of detox diets. I asked N Coldpressed why I should go on a detox. They gave me two reasons. A detox can be used for two main purposes. 1. To cleanse. Clearly, it means to clean the system by letting the toxins out. Research is still on by some of the top institutes on the type of toxins and the quantity, but there’s decent evidence available to support that such a detox diet taken systematically helps the toxins out. 2. As a “routine-breaker”. For instance, if a person keeps eating the same amount of solid food throughout the life be it healthy, it is sure to make his/her body addicted to the pattern of the food, which in no terms is a great way to go about with the lifestyle. This is exactly what a detox can help you with. It is important to give a break once in a while (Depending on the lifestyle but for sure at least once in 15 days, as it takes 18 to 40 days to get the body used to something). I’m greatly sceptical about the claims of flushing out the toxins through juicing. Toxin is a generic, fear-inducing term that sets off the alarm bells. However, since the detox or cleanse diets don’t specifically mention any toxins, it’s impossible to do a before and after comparison to confirm the validity of the claims. The excretory system of our body is tasked with periodically flushing out a whole host of excess and unnecessary materials from the body and does a good job by itself. While drinking fluids is essential for the correct functioning of the excretory system, is there any added benefit of going on a purely liquid diet? N Coldpressed didn’t furnish any scientific proof, and I struggled to find any credible research backing ‘detox diets’. “There isn’t any convincing evidence that detox or cleansing programs actually remove toxins from your body or improve your health”, states US National Institutes of Health. A paper published by the official journal of The British Dietic Association in 2014 also concluded that “At present, there is no compelling evidence to support the use of detox diets for weight management or toxin elimination”. Several other scientific magazines and mainstream publications have also been critical of detox diets. The second benefit touted by N Coldpressed is that juicing also acts as a routine breaker. This is entirely subjective but for me the more compelling reason to opt for a detox. Being a food blogger, I often end up overindulging in unhealthy food. 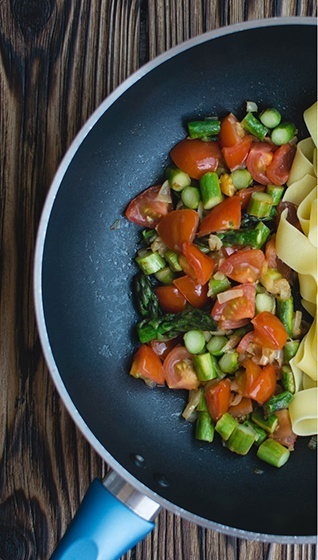 Detoxing is a quick and easy way to break the routine. A two-day detox will not magically make me healthy, but it did help in shedding some of the water weight and made me feel less bloated. It was also instrumental in helping me realize that I needed an urgent course correction to tackle my obesity. Soon after this detox experience, I embarked on a ten-week regimen that not only helped me in shedding over nine kilos but also improve my key health parameters. N Coldpressed argues that no one wants to chew down ten pounds of veggies, and juices are a convenient way to get all the nutrition you need. Unfortunately, some of the juices taste worse than most raw veggies. I didn’t expect health juices to be super delicious but was still surprised by how offensive some of the juices were. And, this is coming from someone who enjoys bitterness as a flavour. From the humble bitter gourd to a cup of espresso to Angostura, I am usually fairly comfortable in handling bitter notes in moderation. 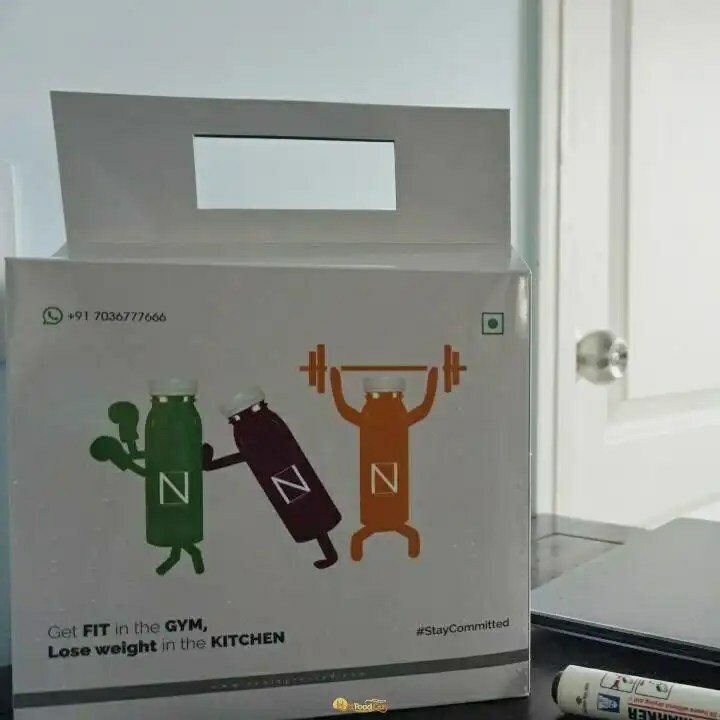 Nevertheless, convenience is one of the biggest benefits of N Coldpressed. The juice pack is delivered to your doorstep in the morning and all you have to do is remember to consume the appropriate juices at the appropriate time. You don’t have to worry about what to buy, from where to buy from, and how to cook. The convenience comes at a price though. The Enhancer and Eclectic packs cost Rs. 1200 per day, while the anti-oxidant rich Elixir pack is priced at Rs. 1500 per day. This is at par with how other detox programs are priced, which are targetted at the affluent, health-conscious consumers. 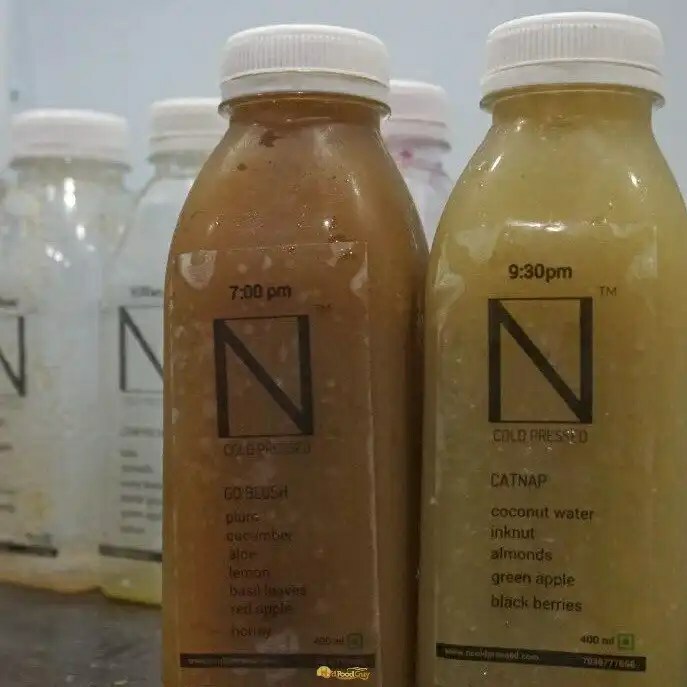 The N Coldpressed experience was challenging, interesting, and rewarding for me. There are caveats that are worth being aware of before taking the plunge. I don’t believe the detoxing flushes out toxins, and the additional health benefits of cold-pressed juices is debatable. The incident on the morning of the second day was an unexpected complication that should quite obviously not happen. My shoddy health was possibly the biggest contributor, but the rapid recovery on consuming salts suggested that perhaps adding a Na/Mg supplement to the juicing regimen would have avoided the scenario. Yet, it’s undeniable that going through the juicing was an experience that made me more health conscious and drove me to make changes to my dietary habits. And for that alone, I’d recommend that you should at least try the 1-day detox pack to determine your mileage.